It's that time of the month again - time for us to hold another online session open to the general public interested in G.W.F. 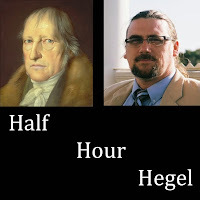 Hegel, philosophy more general, or the Half Hour Hegel project! Tomorrow evening, from 5:00-6:00 PM Central Time, I'll be hosting our monthly online Hegel Q&A and Discussion session. We give priority to anyone who wants to talk or ask questions about Hegel specifically, but I'm open to discussing all sorts of other topics, and some of the attendees often bring a host of other ideas to the table. If you are looking for some clarification about Hegel's works - they're tough, right? - then you definitely want to make the time to log in to this session. For the time being, we are still using this FreeConferenceCall platform to log in to the videoconferencing, but we're going to look at other platforms for next year. So, feel free to pop in. You can chat with me - I'll be there. You can just lurk and listen - if that's what you're into. But I'll be there, along with any other interlocutors who make the time, ready to discuss the thought of this great German philosopher! 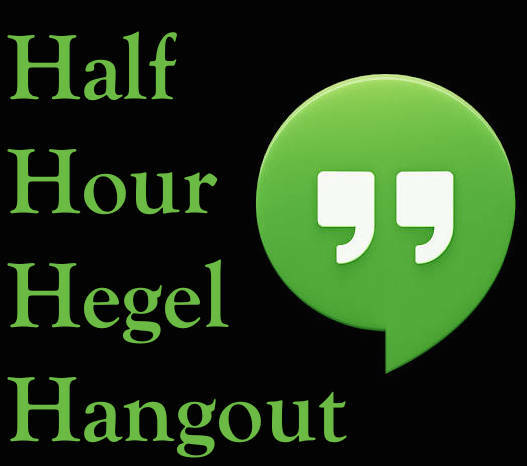 Every month we host two online Hegel Q&A and Discussion "Hangout"s - one for the general public, and one for my Patreon supporters of the project (both of them brought to you by those Patreon supporters' generous underwriting). Today, from 3-4 PM Central Time, I'll be hosting the one for the general public - and that means literally anyone who has an interest in Hegel, German Idealism, post-Hegelian philosophy, or even philosophy more generally - you're all welcome! We often veer off into other topics of conversation, ranging from contemporary events and politics, to my current crop of students, to ancient and medieval philosophy, to. . . but, we do give priority to any questions, comments, or conversation that's more explicitly Hegel-related. Here's the link you can use to get into the session. You can come to chat, or even just to lurk and listen, if you like. Hope to see some of you there! Why is this section titled with those terms? In Hegel's German, it's actually just one term, "Die Verstellung", which could be rendered with either of those terms, or even "disguise". You might ask who is engaging in dissemblance or duplicity - and what is being mis-represented (if you'd like to play off Vor-stellung) in that way. At any rate, here are those three first videos. More yet to come in this section. Final Four Videos In "The Moral View of the World"
We're making progress through this last big portion of the Spirit section, "Spirit That Is Certain of Itself: Morality." With these four videos, we finish up the first portion of that section, "The Moral View of the World". Who does Hegel have in mind here? One might well think that his dialectical criticism is directed primarily at Immanuel Kant. But really, there's a much broader tendency in culture to identifying morality and duty over against our natural human inclinations and drive, and their satisfaction in happiness - more so in Hegel's time perhaps than in our own - that his discussion really bears upon. Every month, I hold two online Hegel Q&A and discussion sessions. One of them - for anyone in the general public - is coming up later today, at 4 PM Central Time. Here's the link you can use to get into the session, if you'd like to attend. Everyone is welcome. You don't need to have a background in Hegel, German Idealism, or even philosophy more broadly - just an interest to learn, to discuss, or even to lurk and listen! I do give top priority to anyone who has questions or comments specifically about Hegel, so if you've got some, don't be shy - we'll address those right off. 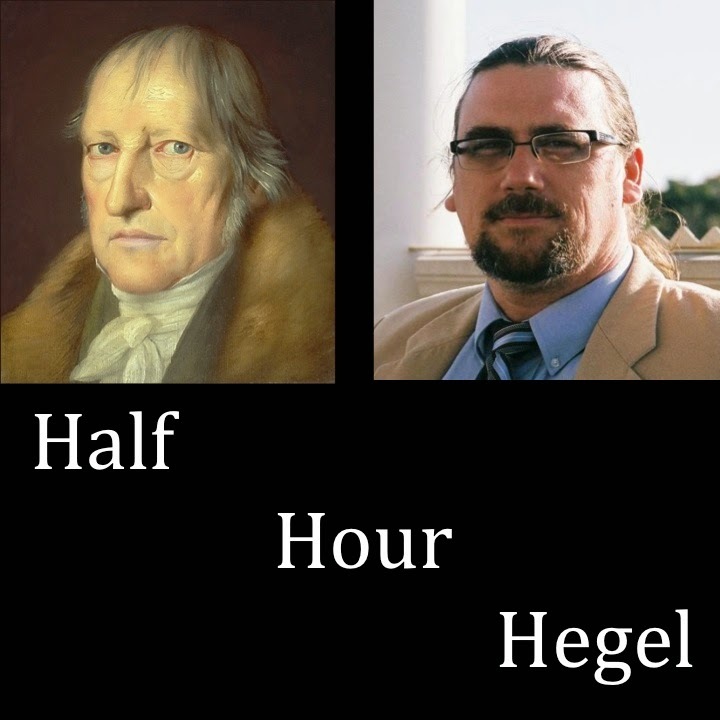 I also offer a second Hegel Q&A and discussion session each month as a perk for Patreon supporters of the Half Hour Hegel project. If that's something you're interested in - supporting my ongoing work - here's the link for that.